FoodREDi – Ulverstone Neighbourhood House, 8 Lugana Crescent, West Ulverstone, 10am to 1pm Wednesdays from March 7 to April 11. Let’s cook up a storm and learn how to prepare healthy, delicious and affordable meals for you and your family. Learn about food safety, healthy food, how to eat well on a limited budget, how to choose good food options, healthy cooking and the benefits of physical activity. We’ll get together for three hours a week over six weeks to prepare delicious, easy, affordable and healthy meals. 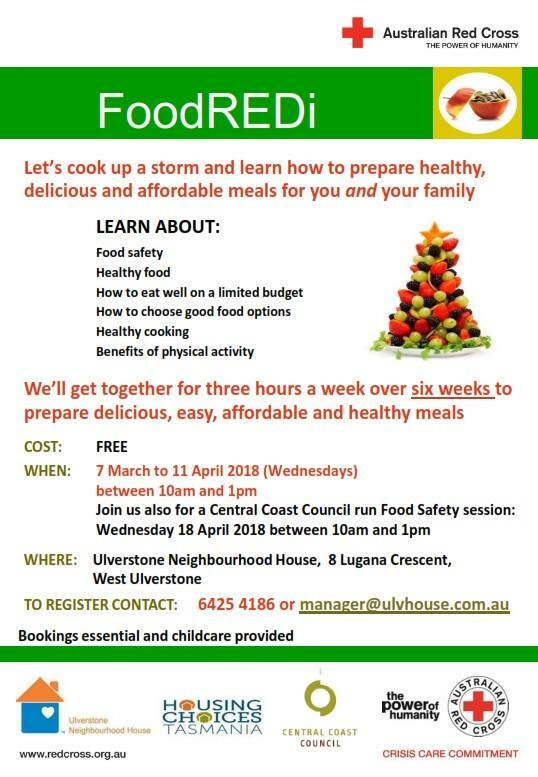 Join us for a Central Coast Council run Food Safety session: Wednesday 18th April 2018 between 10am and 1pm. FREE. To register contact: 6425 4186 or manager@ulvhouse.com.au Bookings essential and childcare provided.